S/V ORCA III: last posting til the Tuomotos! last posting til the Tuomotos! food is always desplayed beautifully!! I even got 2 of these "plates" given to me!! the children here are so beautiful especially in their traditional dress!! hey all , we will be leaving for the Tuomotos tomorrow Tuesday. it is around 500NM about 3-4 days depending on wind ect. will be travelling with Malachi and O'Vive. and meeting up with lots more cruisers. here are a few more pictures for you to look at. there are a lot of horses here!! and this is everyone reapplying the bug dope for the 10th time and we still got eaten alive!! 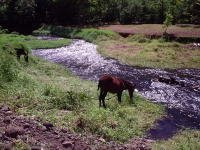 its to bad about the nau naus, cause it is paradise here if not for those dam bugs! they sure bite and itch!! Fabulous photos once again. It's been a busy weekend here in our own little piece of heaven...golfing was great fun with Wendy, Joe, Danielle, Andrew and Marge. Marge and I lost so had to buy lunch for everyone - that was the suggestion of the golfing professionals (Andrew and Danielle)...should have know we were being set up..lol. But we didn't mind a bit - it was a hoot. Safe sailing sweet Tremblays..we miss you and keep you always in our thoughts and hearts.